Confusing sanctions are keeping important technologies from Iranian activists. A young man wears a green ribbon around his wrist as a support sign for reformist presidential candidate Mir Hossein Mousavi at an Internet cafe in Hamadan, Iran, on May 26, 2009. The Iranian government has been fortifying its so-called “electronic curtain” in recent weeks. Connection speeds have slowed so dramatically that many basic websites and applications are unusable. Government monitoring of popular social networks such as Facebook and Twitter is on the rise. And common circumvention tools such as virtual private networks, which allow users to stay off the government radar, have become inaccessible. Meanwhile, technologies by U.S. companies that support freedom of expression and secure communications are not available in Iran, Syria, and other fraught places—not because of bans by the regimes, but because of the complexities of U.S. sanctions. Companies face continued legal uncertainty, perceived political risk, and costs that deter them from making such technologies available. That’s why U.S. sanction regulations need to be updated to fully take into account the lessons of the Arab Spring and to support human rights online. That’s why it’s good news that Wendy Sherman, undersecretary for political affairs at the State Department, announced this week that the administration will take new steps to address this problem. The situation in Iran, in particular, is heating up in anticipation of the presidential election on June 14, when Iranians will go to the polls to select a successor to Mahmoud Ahmadinejad. In mid-April, the government announced that a “special election cyberunit” called Fajr had been created to monitor social networking sites, and last week, the Guardian reported on a pre-emptive crackdown on activists. Offline, the government has canceled university classes and arrested several prominent journalists. 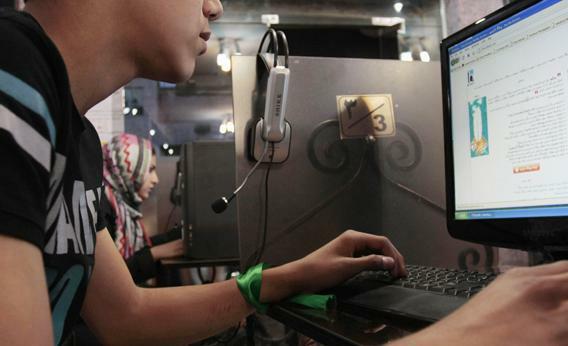 Connectivity and the ability to access foreign websites have often been throttled by the regime’s efforts to control the political situation in Iran, especially in the wake of the Green Revolution of 2009. “On the eve of dates or anniversaries that could give rise to demonstrations, the connection speed is slowed right down to prevent the circulation of photos and videos,” Reporters Without Borders noted in its 2013 “Enemies of the Internet” report. Prior to the March 2012 parliamentary election, for example, the government ordered all Internet cafes to install security cameras and start collecting more detailed personal information from their users, in addition to adding new censorship and surveillance controls on its already heavily monitored network. Reports that the government is building a national information network (popularly dubbed the “Halal Net”) further fuel concerns that the Iranian people will be increasingly denied the right to freedom of expression and access to information from outside sources. President Barack Obama and members of Congress from both sides of the aisle have expressed outrage about the situation in Iran. Since 2009, U.S. policymakers have attempted to incorporate Internet freedom into the Iranian and Syrian sanctions regulations. In 2010, the Treasury Department—with assistance from the State Department—carved out an exemption for Internet-based communications software and services vital to the work of democracy and human rights activists. In 2012, Treasury provided additional guidance by giving specific examples of technologies that are permissible under that exemption, such as Yahoo Messenger, Google Chrome, and Firefox. Meanwhile, last spring, President Obama issued an executive order imposing additional penalties on individuals and companies that provide Iran and Syria with information technology that could be used to restrict speech or monitor citizens. Not having an iPad might not seem like a real problem, but companies’ decision not to operate in authoritarian countries affects the security of people’s communication. When American technology and security updates are not available, it’s easier for authoritarian governments to deploy malware (for example, masquerading as secure tools or updates) so that they can get access to a user’s machine. Last year researchers discovered that a version of anti-censorship software used by many Iranians to bypass government filters was circulating with a malicious backdoor. But accessing a user’s machine is not the end of the story. Dlshad Othman, a computer technician who fled Syria in fear of being arrested, told Bloomberg News last year that he knows of at least two activists who were killed after their computers were compromised. Of course, American-made technology can be hacked as well. But without access to U.S. products, citizens can be forced to rely on alternative services from other countries that are less protective of human rights and makes them even more vulnerable to surveillance and censorship. Congress is currently gearing up for a new round of sanctions legislation to increase pressure on the regime in anticipation of the upcoming transition of power in Iran. Much of the conversation revolves around inhibiting financial transactions and nuclear weapons capability. But information and communications technology are also a key piece of the strategy to put pressure on the regime. Wednesday’s announcement that the administration intends to take further steps to sharpen the restrictions and which consumer communications technologies are allowed is a step in the right direction. Sanctions are supposed to put pressure on governments to change their behavior—not hamper human rights.